The Oil Cleansing Method has allowed me to ditch face soap, lotion and even makeup remover and my skin has never been happier! That’s what I love about natural products – many of them have multiple uses and keep my medicine cabinet clutter-free. Not only that, this method is totally safe with no toxins, sulfates, chemicals and despite popular belief, oil does not clog up the pores with oil. You can blame clogged pores on hormones, bacteria and dirt and this method effectively cleans the latter two and moisturizes at the same time. After my face lotion finally ran out two months ago, I vowed I was going to try this method and stop buying face lotion and soap for good. Especially since every other part of my body now receives all-natural care, from my baking soda shampoo and apple cider vinegar conditioner, to my homemade organic body butter, my homemade lip balm, homemade deodorant, and my baking soda body scrub. Cosmetics and especially lotions are known for being loaded with unwanted garbage that I’d rather not have on my face. I learned from my good blogging buddies, Sarah, from Nature’s Nurture, and Amanda, from Natural Living Mamma, what it is and exactly how it works. According to the oilcleansingmethod.com, the basic concept is that oil dissolves oil so applying oil to the face removes dirt, makeup and oil and leaves the face cleaned and moisturized. I found that it’s the same concept for cleaning the hair, like in my no-poo post where I discuss how traditional shampoos, which contain synthetic detergents called sulfates, strip the scalp of its natural oils and cause the scalp to overproduce oil to compensate. This creates a vicious cycle wherein you need more shampoo and daily cleaning to remove the excess oil, thus drying out the hair and requiring conditioner. Once you start cleaning the scalp and hair with a shampoo that doesn’t contain those sulfates, the scalp returns to its natural state and produces the correct amount of oil and doesn’t need daily cleaning. So the same concept applies to our skin. Sulfates in body washes and face soaps strip our skin of sebum, our skin’s natural oil, causing our skin to be dry and to overproduce oil. Little do most of us know that our skin naturally regulates perfect oil production, but we remove its ability to do so when we disrupt the balance with artificial chemicals like sulfates. Are you ready to try it yet? Great! It’s very simple and you might even feel like you’re in a spa. Castor Oil – key ingredient, a must-have because it dries and cleanses. UPDATE – After making my own room deodorizing spray, I decided I wanted my face oil to smell as wonderful as the spray, so I added 2 drops each of rosemary, cedarwood and orange essential oils. The result is AH-mazing! It smells divine and I really enjoy washing my face now because it truly feels like a facial. PLUS, my face was even more moisturized and soft. The basic concept is that oily skin needs more Castor Oil, and drier skin needs less. My skin is a on the dry side, so I’ve found I need 1:4 ratio of 1 part Castor Oil and 4 parts other oils. I have used Sunflower, Olive and Sweet Almond Oils and honestly don’t notice much of a difference between the three, so I now just use whatever I’ve got in my cabinet at the time. Each person is so different, so I suggest experimenting until you get the perfect combination. Here’s how I do it, and there’s no right or wrong way as long as you use steam to open up the pores. I like to do it at night but in the morning I generally do nothing because splashing water on my face dries out my skin. Take a washcloth, place in the sink, and turn on the faucet to warm. While waiting for the water to get very warm, take a small amount of oil onto the fingers and rub until it becomes warm. Apply the oil to your face and massage in a circular motion to loosen dirt, oil and makeup. I like to take a moment to enjoy the massage, too! Check to see that the washcloth is very warm, but not hot and scalding, of course. 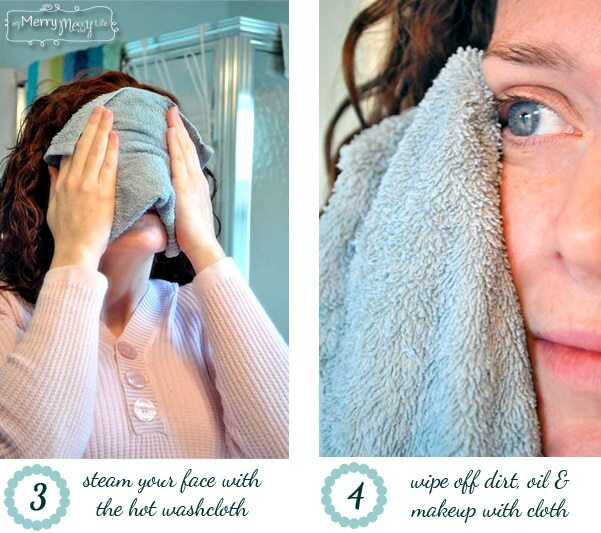 Squeeze out the water and drape over your face. Here is where I practice my deep yogic breathing and concentrate on relaxing and clearing my mind of the days’ stresses. Leave it on as the steam opens your pores, then remove once it cools to room temperature. Use the washcloth to wipe your face – this removes the dirt, oil, bacteria and make-up trapped in your pores. Repeat if desired, which I always do. If your face still feels dry (if it’s winter time, this is a possibility), just take a dab of oil and massage it into the skin as a moisturizer. You’ll know it’s too much if your face is shiny and oily. Next, take your warm washcloth and place on your face, leaving it until it cools to room temperature. The heat and steam will open up your pores so they can be cleaned. Then, wipe off the oil, dirt, and makeup from your face with the cooled cloth. Repeat if desired. Just like going no-poo, your skin will have to adjust to producing less oil for a few days. Remember, it is used to over producing oil because soap strips it of the layer of sebum. For me, the transition period lasted only two days where my skin broke out in pimples. After all the impurities had come to the surface, my face returned to normal again on the third day. So, I suggest trying this method on the weekend when you won’t have to go to work (or whenever you have a few days off).